This book gives readers a detailed look at a technique that is widely used by fashion and costume professionals. It is suitable for sewers who want to use their basic skills to re-create and update their favourite skirts, blouses and handbags in new fabrics and/or to incorporate new details. 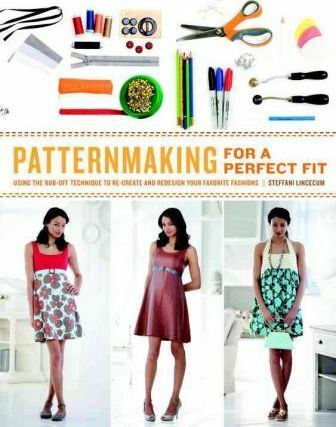 In "Patternmaking for a Perfect Fit", costume designer, patternmaker and teacher Steffani Lincecum reveals the secrets of the rub-off, a technique used by fashion and costume industry professionals, but is little known outside these industries, to create patterns from existing garments. Steffani Lincecum is a designer and instructor with twenty years of professional patternmaking and sewing experience in film, television and theatre. Steffani's reputation as a meticulous patternmaker afforded her the opportunity to work with some of Hollywood's hottest and most highly acclaimed costume designers, including Lori Eskowitz-Carter (Will & Grace, Good Morning Miami), Mark Bridges (Indictment, Nixon) and the late Richard Hornung. She has created custom-made clothing and accessories for Madonna and Bridget Fonda. This is her first book.